When I moved to Seattle I assumed I would a) make friends; and b) make friends who also owned boats. The first proved more difficult than I thought it would be. Also more time consuming. At the eight-month mark, I started interviewing in the Bay Area, atypically deciding it might be time to take my ball and head back to my home state. And then, just like that, at eight months and two weeks, I met one of my tribe; and eighteen years later, hers is among the few true friendships for which I am most grateful. And in the course of all those years, while I did make a feeeeew more friends, did I make a friend who also owned a boat? No. I did not. Hi. This is Seattle, people. We are sick with water. What is wrong with every single person who owns a boat and isn’t my friend?! Why can’t I have nice things? After many, many years of not-getting-the-nice-things, I got the nicest thing. I got the nicest man on the planet, who also happened to know how to sail, who was patient enough to teach me, and who agreed that we should just buy our own damned boat already and head out. So we did. And we do. So now *we’re* the friends with the boat. But best guy on the planet, it gets better. 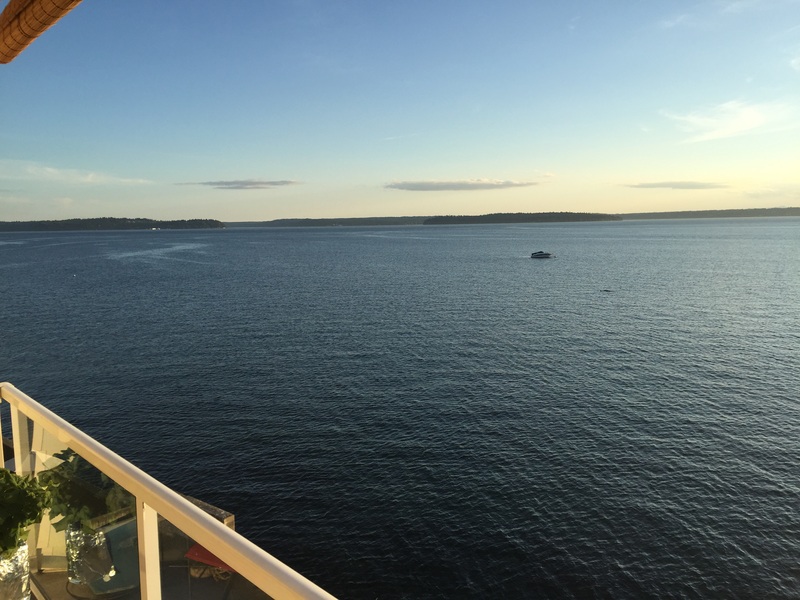 He also came with friends who’s front room literally hangs out over Puget Sound. I’m talking I walked out on to their deck, and a frickin’ eagle took flight about eleven inches from my left ear. These are friends with an amazebalz view, y’all, which I must say, is a pretty close second to friends with a boat. And friends with a view USED to have a boat, so the points…. I can’t add that high. So anyway, one recent night over wine and one of those Seattle sunsets that still make me cry, they’re so beautiful, we got to gabbing over trip planning and gushing over boat loving, and they broke out their old log books. “That’s so great,” we said, after reading all of their detailed notes about wind speed and weather and crossing times and important details we ask and forget, and look up and forget, and research and forget. “We haven’t broken ours out yet.” Stares. Furrowed brows. “We just haven’t gotten to it.” Disappointed tones of voices. Nostalgic glances. “You HAVE to write in your log book!” Then we spent the next hour reading with them their simultaneously succinct and evocative, beautiful, personal, funny, irreplaceable memories, captured in their log books. We are so thankful for that. Those kinda friends, with that kinda generosity… better than a view or a boat any day. And now, we always write in our log book. Must be in Radio Silence area of Princess Louisa. Ahhhhhhh!!!! Lovely. Thank you for sharing your adventure. It is the journey not the destination. Though I must say you guys are exploring some kicking destinations.